Hi, crawlers! The tournament is over, so it’s time for trunk changes. Fair warning: there’s a lot of them! So I broke it up with some screenshots of the new tiles (described near the end), just for you. Ukayaw the Reveler, god of ecstatic dance. Tactical piety: gain piety by damaging enemies, lose piety extremely rapidly over time. 1*: Stomp: deal damage to all adjacent enemies, increasing with their max HP and with your Invocations skill. 2*: Line Pass: instantly pass through a contiguous line of enemies, confusing some. Solo Time: On reaching 3*, all visible enemies are briefly paralysed, for a time increasing with Invocations skill. Pain Bond: On reaching 4*, all visible enemies gain the Pain Bond status, causing them to share damage taken with other nearby Pain Bonded enemies. This can cascade! 5*: Grand Finale: spend all piety to telefrag target intelligent monster. They explode. Hepliaklqana the Forgotten, god of ancestral memory. On joining, grants a permanent ancestor spirit that fights alongside you. The ancestor increases in power as you level up, and will reappear on a delay after dying or being trapped in the Abyss. 0*: Recall: recall your ancestor. Works across different floors. 2*: Remember Life: choose between Hexer, Knight or Battlemage classes for your ancestor. Hexer: starts out with Slow, Confuse, and a dagger of draining. At XL 15, trades Slow for either Paralyse or Metabolic Englaciation (player’s choice). At XL 21, trades Confuse for Mass Confusion. At XL 27, swaps the dagger for an antimagic quickblade. Knight: starts out with a shield, long blade, and bonus AC. At XL 15, swaps to either a flaming broad axe or demon trident (player’s choice). At XL 21, the shield becomes large & reflecting. At XL 27, the weapon switches to a speed ego. Battlemage: starts out with Throw Frost, Stone Arrow, and a quarterstaff. At XL 15, trades Throw Frost for either Iceblast or Bolt of Magma (player’s choice). At XL 21, swaps the quarterstaff for a freezing lajatang. At XL 27, swaps Stone Arrow for Lehudib’s Crystal Spear. 3*: Transference: swap your ancestor with another creature in LOS. The player is a creature in LOS. 4*: Idealise: heal your ancestor, remove harmful status conditions, and apply the Idealise buff, which increases AC and doubles damage & spellpower for the duration. Duration & healing amount scale with Invocations. 5*: Transference slows enemies adjacent to the target, for a duration dependent on Invocations power. Many divine abilities have had their hunger costs removed (ABCJMOP1) or increased (KTY). Beogh’s water walking now lasts until you reach shore, even if you drop below the required piety, enter penance, etc. Funny though “drowning by using Smite too many times in a row” was. Pakellas’s wrath no longer drains the player or their devices, but instead passively prevents device use for its duration. Pakellas no longer gifts potions of magic to mummies. Dithmenos’s Shadow Step can now be used to step into invisible enemies’ invisible shadows. Monsters hated by your god (e.g. wizards for Trog) can once again be temporarily enslaved. Gozag will no longer attempt to bribe your own summons. Deep elf archers no longer fire in melee. Hellions no longer resist fire or are vulnerable to cold. The arbalest ‘Damnation’ no longer provides resistances, but does significantly more damage. Firestarter and Frostbite now provide immunity to fire & cold clouds respectively; the duration of the latter’s clouds have increased. The Staff of Olgreb now has a fixed +9 enchantment, rather than varying by the player’s Poison skill. The Trident of the Octopus King now has twice as large an enchantment bonus per Octopus King ring worn; can *you* get the legendary +24 Trident? The Mace of Variability no longer uncurses itself every turn. The amulet of harm is no longer evil. Corrosion slaying penalties now apply to unarmed & auxiliary (e.g. hoof) attacks. All monster-wielded (or dancing) branded weapons are now listed when they come into sight; this should be helpful for noticing, for example, that d:1 goblin with a dagger of electrocution. Elemental enhancers (e.g. staves of earth, rings of fire) no longer penalise casting spells of the opposite element. Cigotuvi’s Embrace no longer degrades when taking damage. Simulacrum’s duration is somewhat reduced. Dazzling Spray’s damage is slightly lower. 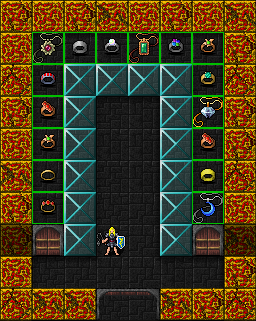 Jewellery tiles have been completely replaced. 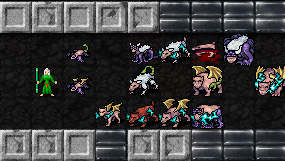 Mutant beasts (from the box of beasts) now have custom tiles that display their exact combination of traits. 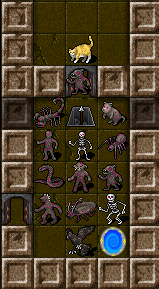 Many more types of zombies, especially those of early-game creatures, now have custom tiles. 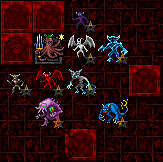 Many low-level demons have new tiles. X> once again finds the closest set of stairs by travel distance, rather than by grid distance. For the first time in three years, being in water not only claims to prevent player invisibility from working (because of the disturbance you leave), but actually does so. The player being silenced no longer prevents monsters from shouting. Muted monsters can once again bristle with rage. Inscribing an item with “<ice>” no longer crashes the game. 11 Responses to "Trunk Updates, 25 May 2016". Good stuff. Trog’s hunger changes were noticeable but not game-breaking. I’m not thrilled by hunger as a mechanic but it felt like an actual consideration with BiA now which seems like it could be a good thing. The new tiles are soooo Bella! And the new gods seem like a good fit for a dedicated, no-magic stabber. Love the updates! I tried out the ancestor in trunk, it’s a really interesting concept to have a perm ally! I had a lot of fun sticking my knight in front of me, carving an adjacent opening, and blasting spells while he defended. Is Hepliaklqana forgotten because nobody could remember the name? jw is Hepliaklqana a temple god? haven’t seen him yet through quite a few playthroughs, loving how it sounds though, the other changes are all welcome, so nice to be able to tell what type of zombie the enemies are just by look now. Temple god, yep – should show up every game, assuming you’re playing trunk. Very nice, I am happy to see new tiles. Hi, why is it, that those updates do not show up in the offline version (I am trying out the Windows one)? @Rosethorne: are you sure you’re using the trunk (not the stable) download? That’s on http://crawl.develz.org/trunk/ , not the stable version’s page ( http://crawl.develz.org/download.htm ). It’s so much fun to read through these changes, even when I’m not playing DCSS. Thank you for compiling them; it’s a great service to the community.